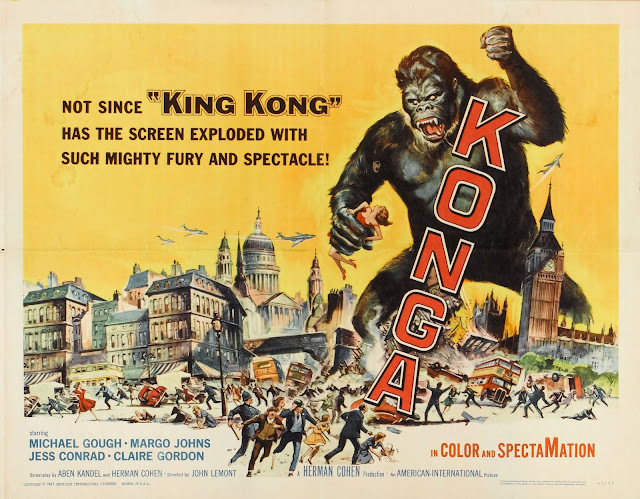 Reverend Guimo's Blog: I finally watched "Konga" (1961) after years of it being on my watch-list! I loved it. I finally watched "Konga" (1961) after years of it being on my watch-list! I loved it. So I've been on a real "Killer Gorilla" and "Jungle Woman" kick this year (well since the middle of last year). I decided to use that energy to watch some movies I always meant to take a look at, but never got around it. I finally checked out "Konga" from 1961! What a fun and well acted film. I mean that, the quality of acting really sells this film. The titular Konga is a strange creature; a chimpanzee mutated through the use of plant cells from Uganda to become a giant gorilla. 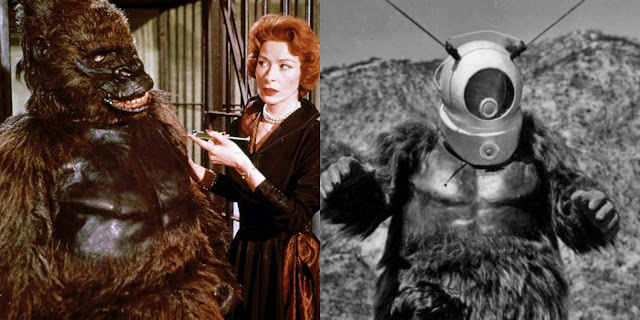 The gorilla suit looks like the same one used in "Robot Monster", but I can't say for certain. I mean, I don't think it's the same suit, but the same brand or from the same manufacturer. "Konga" is more character driven than it is plot driven, with the lead character of Dr. Charles Decker showcasing absolute malice towards anyone who get's in his way. He's spectacular and maybe an underrated mad scientist in monster movie history. He does some really ruthless and unimaginable things throughout the film, and everyone who comes in contact with him suffers horrifically. If you've never seen "Konga" give it a watch. I was expecting an okay film but I got a great one. I'm also aware there is a Steve Ditko drawn "Konga" series that's in reprint so I might check that out eventually.